Blue-Zone was honored to welcome Sheridan College’s Faculty of Applied Science & Technology for a site tour on June 19. 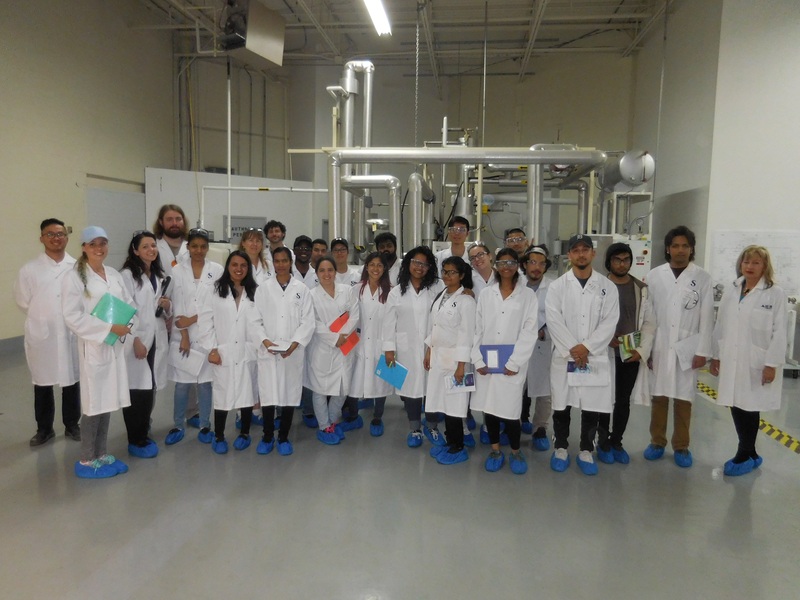 The students learned about Blue-Zone’s patented processes to Prevent the Vent ® and recycle anesthetic waste from medical facilities, while dazzling us with an array of astute observations and insightful questions. We look forward to all the projects they will soon undertake as they embark on their successful careers as Sheridan graduates. Thank you to Professors Pauline Dykes, Daniel Liao and Terry Davison for coordinating this visit, and to all the students for your interest in Blue-Zone’s unique technology. See you soon and best of luck! "Every day, Canadian hospitals create environmental and health and safety hazards by expelling destructive greenhouse gases (GHGs) into the atmosphere. Surgical operations requiring the use of halogenated anaesthetic drugs release alarmingly high amounts of carbon dioxide emissions. With approximately 54,000 operating facilities in Canada, GHGs produced could soon exceed amounts comparable to two million vehicles. "To combat this worsening trend, Blue-Zone Technologies Ltd. has developed a unique solution that allows the capture, storage, and reprocessing of aggressive toxic gases from one central location in the hospital. Blue-Zone currently services approximately 25% of hospitals within Ontario, however the previous technology required one unit per operating room, whereas the new technology requires less space and staff involvement. "On October 25, 2016, the company was awarded a Canadian patent to protect their product and ensure its continued development. 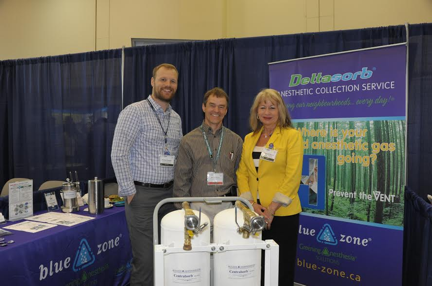 The use of anaesthetic gases is expected to increase globally by 10% to 15% per year; Blue-Zone’s patented technology will ensure these gasses do not reach Canada’s atmosphere." "Multi-award winning company, Blue-Zone Technologies Ltd., has created some of the world’s most innovative medical technology (medtech) innovations. The Ontario, Canada-based business is known for its Centralsorb® and Deltasorb® systems that remove and store GHG emissions from medical buildings. 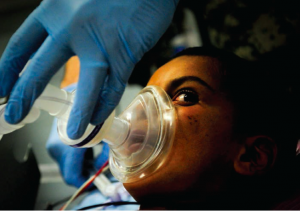 "Years ago, Blue-Zone began implementing Deltasorb® technologies in hospital operating rooms to remove anaesthetic gases, but this required several units and training for all medical professionals who needed to use it. Alternately, the company’s new Centralsorb® system is a centrally-located device within medical offices. The single unit only requires one operator, greatly reducing the space and time required for the technology to operate efficiently. "Once stored, Blue-Zone’s technology can liquefy anaesthetic gases and recycle them into gasses that can be used again." "Based on the global rise of greenhouse gas emissions, Blue-Zone is well positioned to grow beyond Canada. The firm’s commitment to research and development has provided an undeniable market advantage, and was made possible through Canadian government grants. "Blue-Zone used Canadian research grants such as the Sustainable Development Technology Canada (SDTC), and the Innovation Demonstration Fund (IDF) to accelerate development and bring their technology to market faster..."
"Our technology enjoys a global profile, and the awarding of this patent reinforces Blue-Zone's position of worldwide leadership in the halogenated anesthetic gas collection, reclamation, and production sectors. As we are a Canadian company, the Canadian patent grant is extra special for us," says Dusanka Filipovic, P.Eng., co-inventor of Centralsorb®, and Founder, Vice Chair and President of the company. "Blue-Zone's patented technologies are a Cradle-to-Cradle® solution to a global problem, and align with today's international mandate by reducing a hospital's carbon footprint, protecting public health, and building valuable anesthetic production capacity, which is beneficial for the environment and mankind..." CONT. 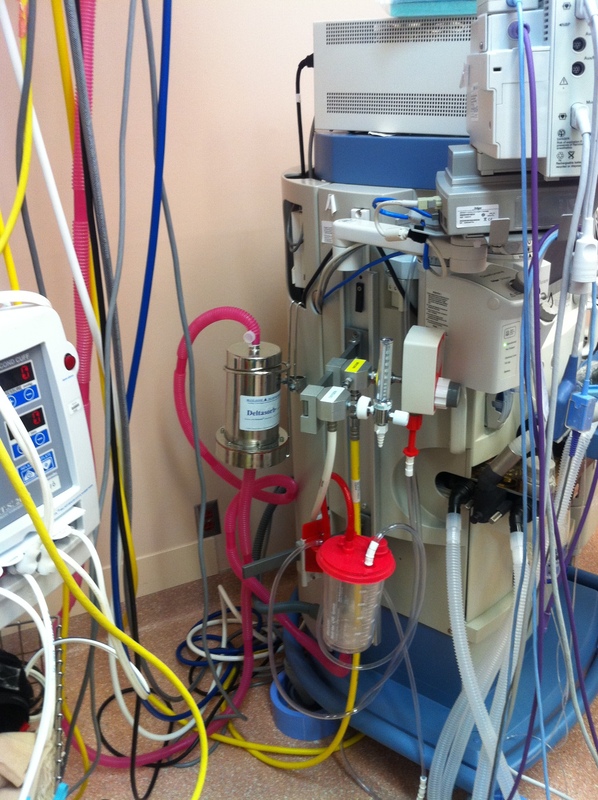 "The USPTO has granted Blue-Zone Technologies an additional patent for its Centralsorb Anesthetic Recovery System, which recovers anesthetic gas waste from a hospital’s central location. "Comparable to Blue-Zone’s patented Deltasorb — which performs the same task in operating rooms — Centralsorb focuses on centralized locations. 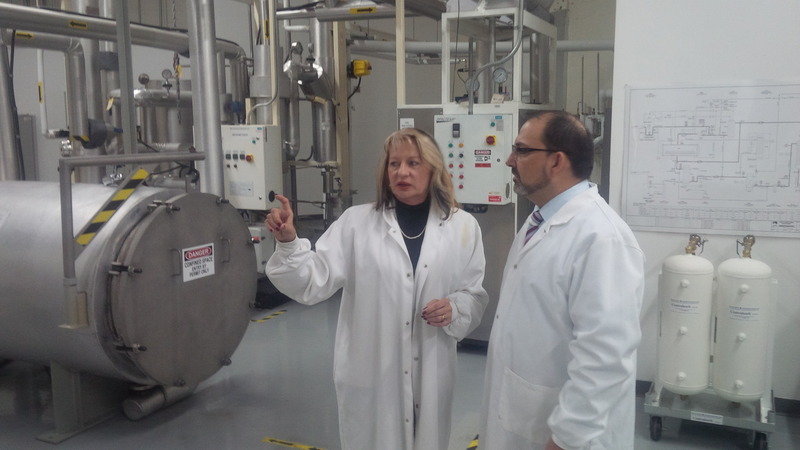 "Positive efficacy results were observed during testing at Sunnybrook Health Sciences Centre and the Cleveland Clinic Foundation in 2010..."
On November 25 2015, Blue-Zone was honored to welcome MPP Glenn Thibeault (Parliamentary Assistant to the Minister of the Environment and Climate Change) to our production facility in Concord, Ontario. We always find it humbling to raise the profile of anesthetic pollution and the movement to Prevent the Vent® globally, born-and-bred right here in Ontario. We hope Minister Thibeault enjoyed learning about our process and all the hard work dedicated to pioneering this proudly Canadian solution, and would like to thank his entire team for their steadfast commitment to green programs and clean technologies. The Blue-Zone brochure has been updated to reflect all recent activity. Beware of false claims from elsewhere. Blue-Zone remains the only commercially viable solution in the world for true Halogenated Drug Recovery and Cradle-to-Cradle® Anesthetic Stewardship. Along with all our partners over the past 15+ years, we are proud to be Greening Anesthesia® pioneers and excited to see our services finally gain widespread support. Please click here to learn about the revolutionary Deltasorb® and Centralsorb® Anesthetic Collection Services, and to see how to get your hospital involved. Thanks for Preventing the Vent®! Operating rooms are sites of some of our most advanced health technologies, where bodies are healed and lives often saved. Yet for the climate, operating rooms are surprisingly unhealthful. On Friday March 14, The Hon. Dr. Kellie Leitch PC MP O.Ont, FRCS (C), Minister of Labour & Minister of Status of Women, and Thornhill MP the Hon. 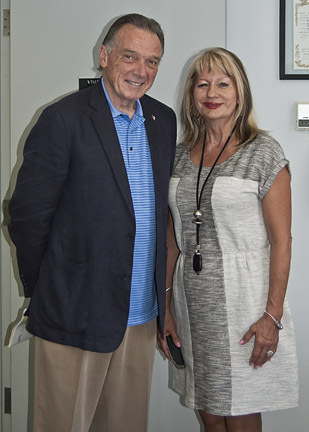 Peter Kent visited Blue-Zone Technologies' offices in Concord, Ontario. A short question and answer period was followed by an extensive tour of the facility, along with plans to stay connected in the future. Blue-Zone is humbled by the continued support of all dignitaries to educate the general public on the threat of anesthetic waste- and the outstanding work being done in hospitals across Canada to "Prevent the Vent!®" for once and for all. We again thank the Ministers for taking time out of their hectic schedules to learn about the Deltasorb® Service and the only true Halogenated Anesthetic Drug Recovery technology in the world. We look forward to seeing you again! SNOQUALMIE, WASH. - Spacelabs Healthcare announces a partnership with Blue-Zone Technologies, Ltd., a private Canadian company based outside Toronto, to offer Blue-Zone Technologies' Deltasorb® anesthetic collection service as a solution for hospitals to eliminate the release of harmful halogenated anesthetics, a significant class of pharmaceutical waste into the public environment. "We recognize the impact anesthetic gases can have on the environment," said Nicholas Ong, President, Spacelabs Healthcare. "Spacelabs is committed to addressing these environmental pollutants by taking the Deltasorb® technology global." 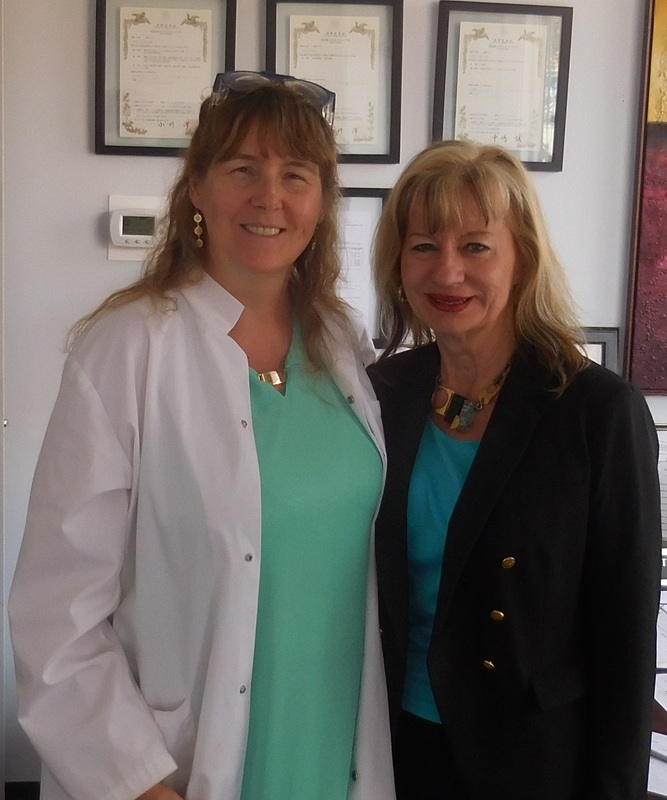 On August 22 2013, Blue-Zone had the pleasure of hosting a visit from our local MP and former Minister of the Environment, the Hon. Peter Kent. A press release was issued at the link below. Blue-Zone is eager to soon "Prevent the Vent!®" of harmful anesthetic gases at all York Region Hospitals. OTTAWA, ONTARIO--(Marketwire - March 21, 2013) - Sustainable Development Technology Canada (SDTC) today congratulated the Government of Canada on the additional $325 million over eight years committed in Budget 2013 for investment in Canadian cleantech companies. 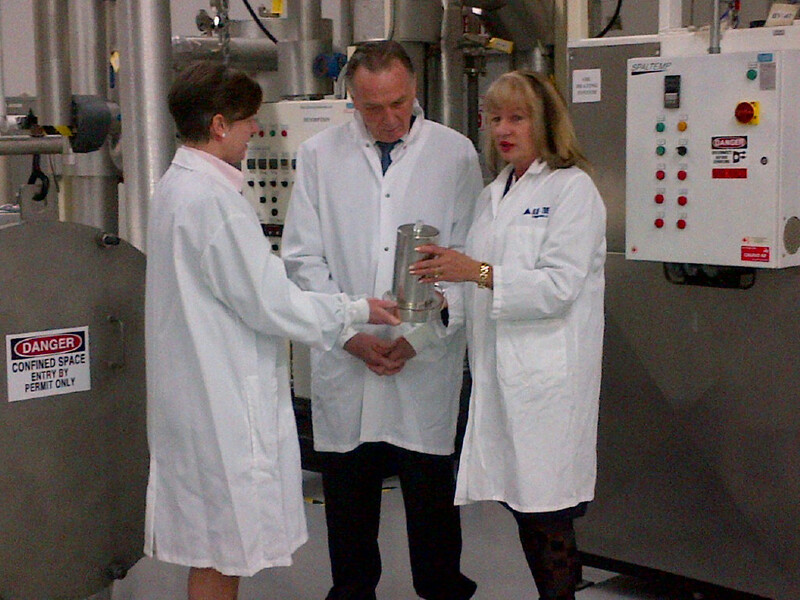 "The investment announced today will continue Canada's leadership in commercializing innovative clean technologies, supporting a thriving part of Canada's economy, a source of high-paying jobs and growth for Canadian companies and an important part of Canada's future prosperity," said Vicky Sharpe, President and CEO of SDTC. "This support will allow SDTC to continue putting innovation to work in a sector that could bring in as much as $62 billion and employ 126,000 by 2020." "Capturing Greenhouse Inhalation Anesthetics for Better City Atmosphere"
Dr. Carly Peterson, TSH Anesthesiologist, adjusts the Deltasorb® canister. All of the operating rooms now have a Deltasorb® Inhalation Anesthetic Gas Recovery System developed by Blue Zone... Gas is captured in the canister, and then sent to Blue Zone for processing back into raw material to produce a new line of ‘green’ anesthetics. Blue-Zone will proudly be attending and once again hosting a booth at the upcoming Ontario Anesthesia Meeting in Toronto, ON. Come say hi and learn about all the exciting developments over the past 12 months in the field of Greening Anesthesia® and halogenated waste recovery. We will also be running a promo for new joiners- valid only for this weekend- so don't miss it! Blue-Zone participated in the Greening Health Care Sustainability Forum on May 13 2011, hosted by the Toronto & Region Conversation Authority (TRCA) at Black Creek Pioneer Village. This annual event brings together 21 member hospitals of the TRCA's Greening Health Care Initiative who are as committed to raising their environmental performance as they are ensuring the health and well-being of their respective communities. The Forum was a resounding success as Blue-Zone continues to "Green Anesthesia" and promote its sustainable solution to “Prevent the Vent!®" of toxic anesthetic gases into the atmosphere. SDTC Celebrates Blue-Zone: "Pulling Huge Benefits out of Thin Air"
To read the full article (@SDTC.ca) please CLICK HERE. 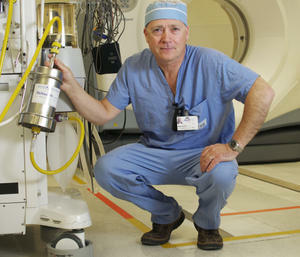 Eight years ago, Doug Bodie, an anesthesia assistant at Kings­ton General Hospital, made a surprising discovery. He was asked to take part in a trial of a filtration system that would trap expelled anesthetic gases, gases that have been proven to be environmentally unfriendly. "I wasn't aware of the environmental issues, because green wasn't in back then," Bodie said. Only about 5% of the anesthesia patients are given during surgery is metabolized, Bodie learned. The remaining 95% is vented through the hospital's stack and into the atmosphere. Despite not knowing about the environmental concerns the untreated gases were creating, Bodie said, "it's just good to know that this is a 100% green project. "You're starting with the drug, and, at the end of the day, you will end up with the same drug," Bodie said. "We're not polluting the environment, and it's good for everybody." 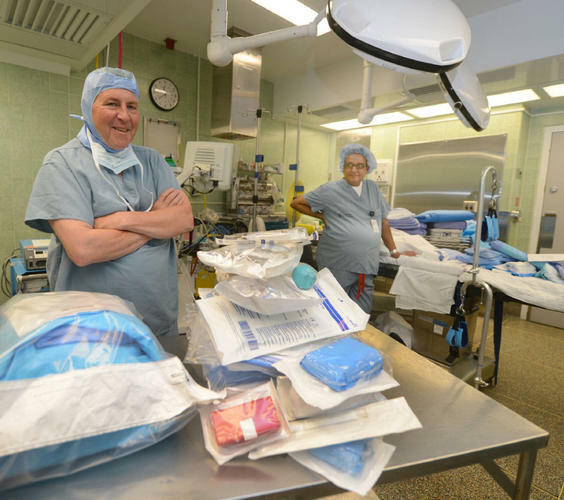 For full story Kingston General Hospital is Greening Anesthesia. "Blue-Zone Technologies Ltd. of Concord Ontario, Canada is very pleased to release the first video to feature their anesthetic gas recycling service, sharing the testimonials of leading doctors and cutting-edge environmental executives who have adopted the technology at major hospitals in Southern Ontario... "
On December 16 2010, dignitary Reza Moridi, M.P.P., Parliamentary Assistant to the Minister of Research and Innovation, toured Blue-Zone’s showcase Deltasorb® Anesthetic Collection Facility and pilot scale inhalation anesthetics production plant. On November 16 2010, Blue-Zone hosted a "Friends of Blue-Zone Appreciation Night" at the McLean House, Estates of Sunnybrook in Toronto. Hospital partners from across Ontario were honored for their longstanding support of the Deltasorb® program and their visionary commitment to Greening Anesthesia®. Blue-Zone Technologies is pleased to announce the launch of its new Deltasorb® Anesthetic Collection Service website. The website is a resource for hospitals and concerned citizens to learn about the impact of venting toxic anesthetic gases into the atmosphere and to learn about what more can be done to prevent it. We invite you to explore the website and to contact us with any questions. When Dusanka Filipovic formed Blue-Zone Technologies in 1999, she knew its unique clean technology could capture the attention of global markets. Ontario's hospitals spend $20-million a year on the chemicals that induce anesthesia during operations, only to vent 95 per cent of them into the atmosphere. Blue-Zone says these greenhouse gas emissions equal the annual exhaust output of 30,000 cars. The Concord, Ont., company captures the gas not used by the patient in special canisters and recycles it so it can be sold back to hospitals, at reduced cost, in its pure liquid form. This lowers expenses for hospitals and keeps anesthetic chemicals and greenhouse gases out of the air. "From the beginning, it was very clear it would more than just benefit the company - it would benefit the entire world," says Ms. Filipovic, the company's president and chief executive officer. 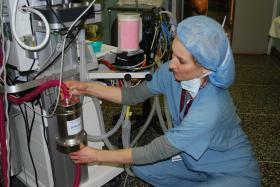 For full story Blue-Zone's Deltasorb® : "A remedy for the operating room" - Globe and Mail.